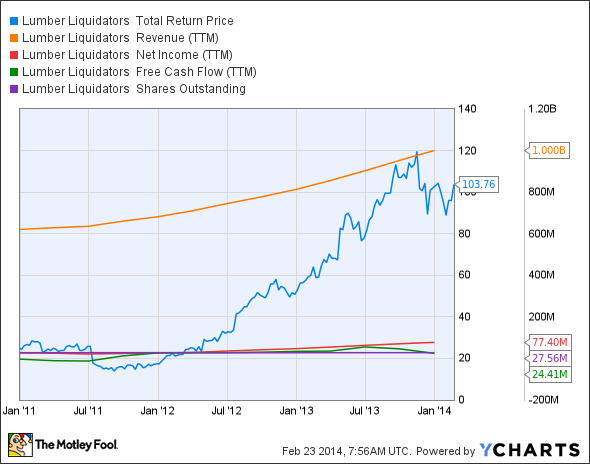 Is Lumber Liquidators Holdings Inc. Destined for Greatness? A housing-market rebound has propelled Lumber Liquidators to new heights, but the easy gains may soon be gone if interest rates rise. Investors love stocks that consistently beat the Street without getting ahead of their fundamentals and risking a meltdown. The best stocks offer sustainable market-beating gains, with robust and improving financial metrics that support strong price growth. Does Lumber Liquidators Holdings Inc. (NYSE:LL) fit the bill? Let's look at what its recent results tell us about its potential for future gains. LL Total Return Price data by YCharts. *Period begins at end of Q4 2010. 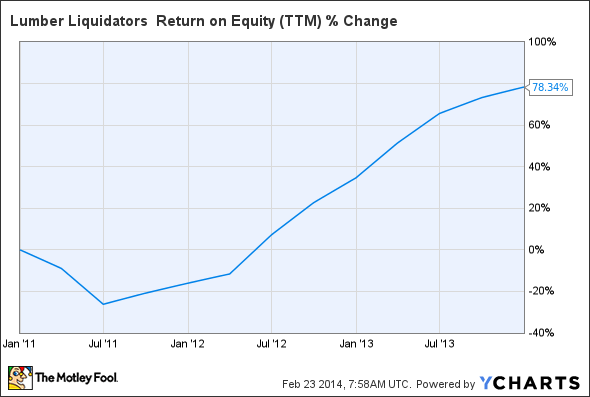 LL Return on Equity (TTM) data by YCharts. Lumber Liquidators puts together a strong performance, missing out on a perfect score only because share price growth has surpassed gains in net income during our tracking period. Over the past three years, Lumber's revenue has grown at an impressive rate, but more importantly, the company has turned that top-line growth into even better bottom-line gains. 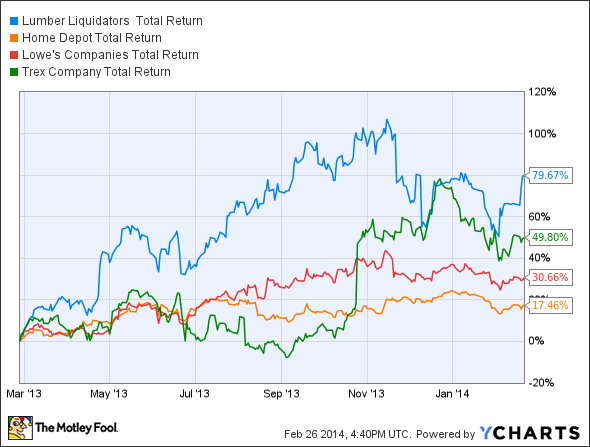 But does that mean that Lumber Liquidators will keep outperforming in the future? Let's dig a little deeper to find out. Lumber Liquidators recently reported better-than-expected revenue and earnings per share for its fourth quarter, thanks to improving housing-market conditions, which drove a mammoth 15.6% uptick in same-store sales. Fool contributor Daniel Jones notes that the company added 11 new stores during the quarter, bringing its total domestic store count to 318. Revenue per customer grew by 7%, and store traffic surged by 8.6% -- not only is Lumber Liquidators bringing more people in, but it's also getting them to buy more once they arrive as well. Of course, this outperformance comes at a price -- Lumber Liquidators boasts the highest valuation of any of these companies, although the formerly unprofitable Trex is now close on its heels. According to the Home Improvement Research Institute, or HIRI, the overall home-improvement market will grow at an average rate of nearly 7% in 2014 and 2015, and will then grow by then 5% in 2016 and 4.5% in 2017. This rate, running above GDP-growth estimates for all four years, should provide ample long-term opportunity for Lumber Liquidators and its peers. However, HIRI also expects a minor increase in mortgage interest rates, which will be roughly 4.5% for a 30-year conventional mortgage in 2014. The housing market is already facing upward pressure on interest rates and negative sentiment from homebuilding industry data, which show weakness in both housing starts and existing-home sales in January. Fool contributor Dan Caplinger notes that the Federal Reserve's gradual reduction in bond-buying activity (the dreaded "taper") could send mortgage interest rates much higher, making it harder for homeowners to finance their construction projects. However, sector leader Home Depot is bullish enough on the U.S. housing market to hire over 80,000 seasonal workers for the spring season. Conflicting data is always frustrating, but on balance there appears to be more working in Lumber Liquidators' favor than against it at the moment. Today, Lumber Liquidators has many of the qualities that make up a great stock, but no stock is truly perfect. Digging deeper can help you uncover the answers you need to make a great buy -- or to stay away from a stock that's going nowhere.